One of the biggest differences between home life and dorm life is having a community bathroom. You no longer have a space to store your bathroom essentials, so having an efficient tool that stays organized, dry and hygienic is a must. 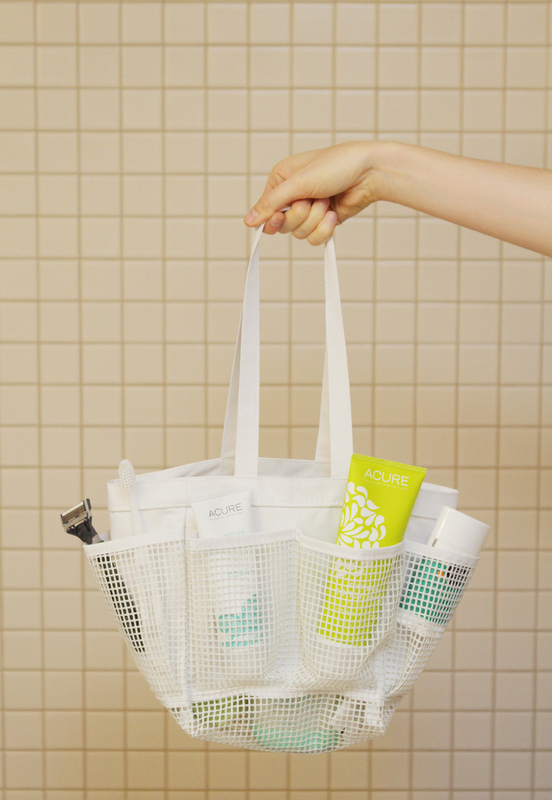 That’s why this soft-sided mesh tote is our top shower caddy of choice. Its soft exterior makes it comfortable to carry on your side, the pockets keep everything up right and separated from each other, and the wide waffled mesh ensures your items stay dry. The handle fits perfectly around a wall hook, so you don’t have to set anything on the bathroom floor. 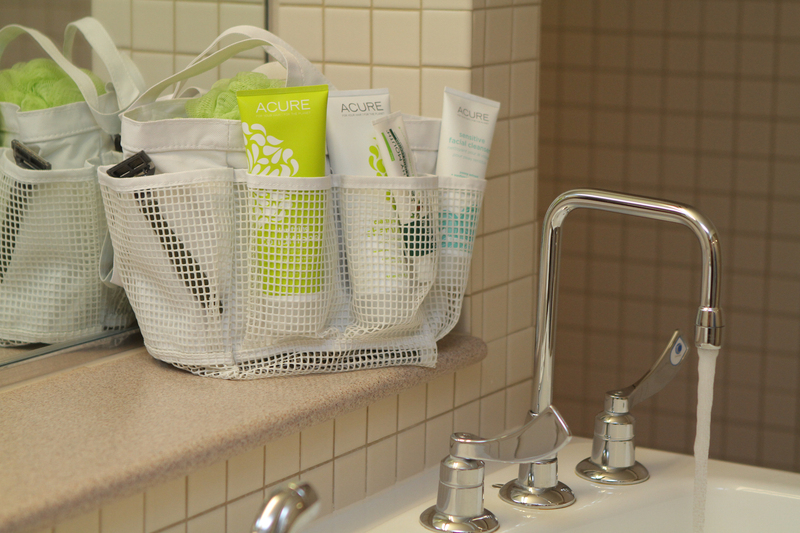 A thoughtfully organized shower caddy can help de-stress your most chaotic mornings. Choose your favorite scented shampoo for an instant pick-me-up in the morning. If your hair will tolerate it, consider saving space by choosing a 2-in-1! Be sure to keep the cap on tight to prevent a minty mess in your shower caddy. If you are sensitive, make sure to choose a product that is fragrance free and nonabrasive. If you are acne prone, go for one that is non-comedogenic – meaning it won’t clog your pores! Opt for a gel-based body wash because there is no place for your bar soap to live, and you wouldn’t want it getting melty and stuck inside your shower caddy. If you do choose bar soap, make sure to have a case to keep it enclosed and away from your other products. A toothbrush cover is always a good idea when you are moving your toothbrush back and forth to keep it away from anything it could touch and collect/spread germs. If you have an electronic toothbrush, you will need to find a space to charge it in your dorm. 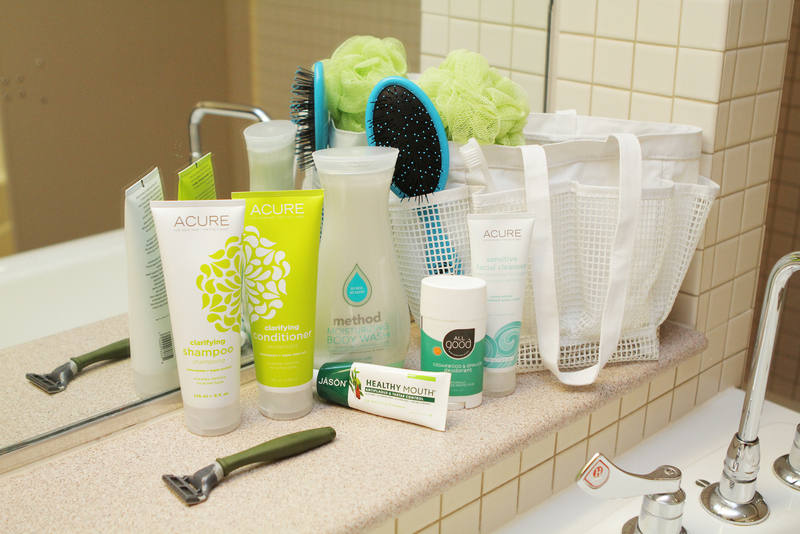 We recommend just to the right of where you store your shower caddy. A shower pouf can hang and dry out much nicer than a washcloth. If you do choose a washcloth, make sure you remove it from your shower caddy each time and hang it to dry properly. To save space, you can choose to apply this back in your room. Just as keeping your deodorant in your room, you could do the same with your lotion bottle. We recommend the wet brush for tangle-free hair. This is something that you probably aren’t used to: showering with flip-flops on. This is necessary to curb the spread of infection. Make sure the shower shoes you choose are 100% synthetic so they don’t soak up too much water. Try not to own too many towels. Invest in one large towel and one hand towel to save space. Pro tip: Buy in bulk (even share with a roommate) and keep the large bottles stored in your closet and dispense them into travel size containers to make your shower caddy lighter.